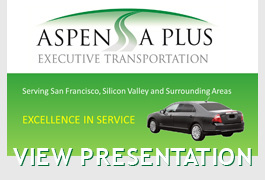 Aspen A Plus Executive Transportation provides business class chauffeured transportation services for San Francisco Bay, Silicon Valley and surrounding areas. We offer door-to-door service, corporate meetings & event transportation, airport transfers, meet & greet services and group transportation for San Francisco Bay's business travelers. Our commitment to quality service and meeting the individual needs of each client is the key to our success. 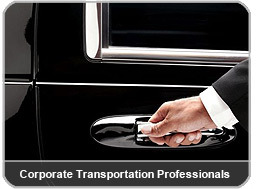 Aspen A Plus Executive Transportation provides complete corporate and private destination management services. 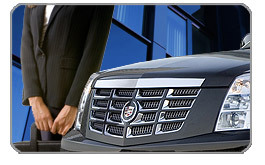 We offer 24 hour service, 365 days a year to meet all of your San Francisco Executive Transportation needs. The professional staff at Aspen A Plus is known for dependability, flexibility and making your ground travel experience the best it can possibly be. With just one phone call, our dedicated team of professionals will help you manage all of your business and personal destination ground transportation. Our online reservation system is in place for you to make online reservations, print receipts and more. Aspen A Plus professional staff will aid you on making the best vehicle decisions for your group, arrange schedules and provide transportation management services. Our corporate services can handle everything you need; business meetings, business outings, conventions, board meetings, special events and other corporate transportation outings throughout the San Francisco Bay, Silicon Valley and all surrounding areas. Aspen A Plus Executive Transportation provides a wide array of professional vehicles to make your clients comfortable and safe while they travel to their destination. No matter what size your group, you will find our vehicles accommodating, clean and driven by our professionally trained chauffeur's. 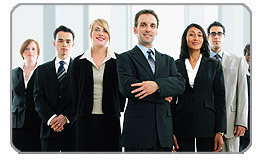 Aspen A Plus Executive Transportation specializes in group chauffeured transportation services. We offer group transportation management consultation to help business managers, event planners and administrative personnel get the right vehicle at the best cost. Our ground transportation services encompass a wide variety of business class transportation and logistical support. As San Francisco's premiere ground transportation resource, Aspen A Plus delivers consistent, dependable and personal service. Aspen A Plus Executive Transportation chauffeurs are professionally trained to meet all your personal transportation needs. Our chauffeurs reflect the best in the industry. Every chauffeur undergoes in-depth training, drug testing and security background checks to ensure the safety of our clients. You will find your chauffeur to be friendly and greet you with a smile. They will help you with your luggage or personal belongings and acquaint you with the amenities within your vehicle. Our chauffeurs are always in contact with our dispatch center to ensure that you get to your destination on time. Aspen A Plus Executive Transportation chauffeurs and staff use technology to help insure your trip to be safe and on-time. 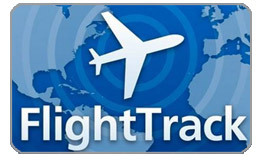 We use the latest technologies such as: Flight Tracking to monitor your inbound/outbound flights so your chauffeur will be there to meet and greet you with a smile when you arrive. We utilize GPS Systems to aid us with navigation and traffic patterns and other vital information that would help us route around any unseen problems that might delay your travels. Weather Alerts, Mobile Communications and Computer Reservations are just a few examples of how Aspen A Plus provides real world travel management solutions to deliver our clients to their destination in a time worthy and respectable manner. Our team is committed to delivering our brand of "Excellence In Service". Aspen A Plus Executive Transportation delivers convenient - 24 hours a day, 7 days a week customer service. Our call center is always ready to answer your questions, provide a quote or take a reservation. Visit our Online Reservation System or call us Toll Free: 800-583-LIMO (5466) or Local 650-869-7295 | 650-728-LIMO.